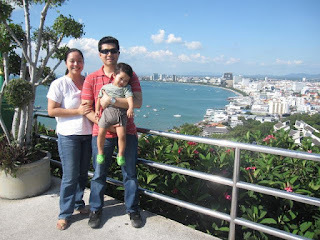 I have written about my early mornings in Cebu. I couldn't believe I was waking up at 5:00 AM then. A year after, waking up at 5:30AM seems late. Moving to a new place means new routines. When we moved to our own place, I started waking up at 6:00 AM just so I could exercise using my WiiFit. In one of Rick Warren/Saddleback Church's podcast, I realized I needed to put God first in my life, which means I must schedule quiet time first thing in the morning. That was when I started waking up half an hour earlier. 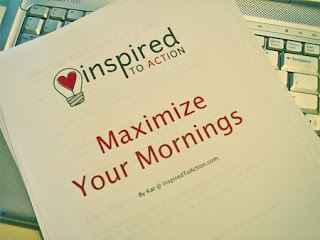 Weeks later, I found my way to Kat's blog, Inspired to Action, as I heard she was giving away a free e-book. 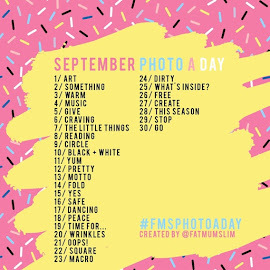 I'm a sucker for freebies. Her free e-book is Maximize Your Mornings which is especially targeted to help mommies create an effective and life giving morning routine. It was a short book which I finished in a day. Every thing she said made so much sense and she has tips on how I can improve that hour and a half all to myself before the rest of my day starts. Worship. Now this is new to me, I would only read the Bible and pray without praise & worship. This actually helped set the tone. Bible Reading. I use the You Version app for my reading plan. They have several reading plans and it now keeps track of your completed plans. I also subscribe to Purpose Driven Connection Devotional by Rick Warren & Saddleback Church. Praying. It's my time to talk to God for Him to hear me out, and for me to listen to Him. Kat has prayer calendars for husbands and children which I use as my guide. Exercise. I still do exercise on my WiiFit Plus but I feel like I am getting bored with them. 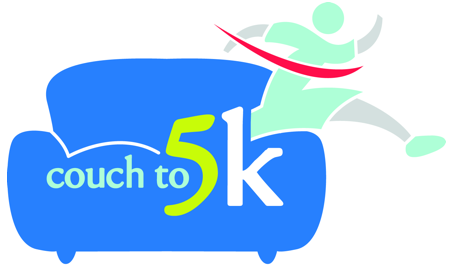 Thanks again to Kat, I learned about From Couch to 5K plan. I never liked running. I can walk though as I love walking. 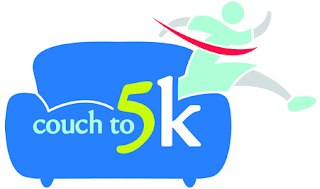 But since I needed a challenge, and after watching episodes of The Biggest Loser where all contestants are running on the treadmill, I wondered if I could also run. My friend confirmed that this plan works so why not give it try. My goal is not to run a marathon, I simply want to lose weight. I miss my exercise classes at Fitness First in the Philippines. But since I do not have the luxury of time as before I need whatever form of exercise I could do. I am now on Week 1 Day 2 of the plan. Remember when I said I don't like running, thankfully I have discipline as I wanted to stop a number of times. But I felt great after the workout and my body muscles were sore which means it is working. My 90 minutes all to myself now ends. My husband is now up to get to ready for work and my little boy would soon wake up. I noticed in the couple of weeks that I had been doing this, I have more energy and no longer sluggish. I am accomplishing more in a day. I get the more important tasks. You, too, can have great mornings. 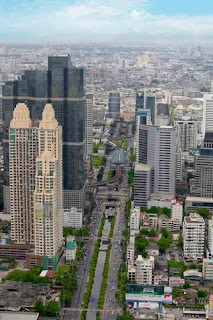 We have reached the sixth month mark of living here in Bangkok. 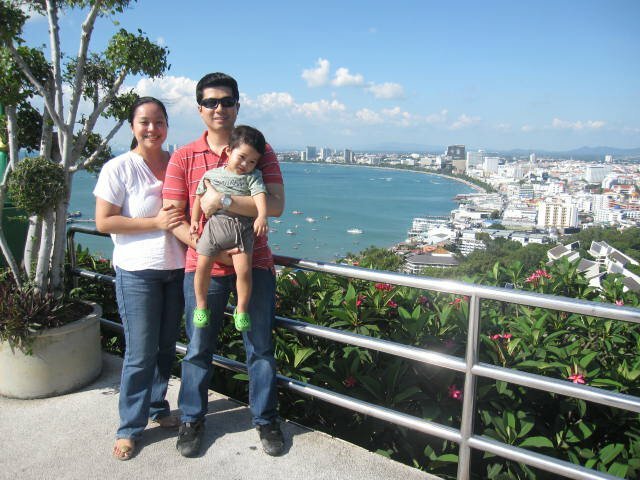 We are happily settled here in Bangkok. Our two bedroom unit is looking more like a home now. I finally hung the frames in each bedroom and started on a photo wall right by our dining table. I found my routine, too. I have my nail salon, waxer, eyebrow groomer and a massage place. I love how a supermarket opened in the mini mall next to our building. It solved my grocery shopping dilemma. I have gotten used to life without your own car. It is challenging and exhausting to ride the BTS Skytrain with Javi but I got used to it. It's either the train or riding a cab in Bangkok traffic. Yes, you choose the lesser evil. The heat is unbearable. It feels like we're in a sauna all day. The good thing about is the laundry dries up so fast. We arrived here and Javi wasn't even walking yet. Six months later, he is now running and I am the poor mommy who chases after him. My little boy finished his first swimming class, too. When we moved to our own place, the farthest I had been to was the Chatuchak Weekend Market. Fast forward a couple of months and we have visited Pattaya, Ayutthaya and Chiang Mai. And visitors just keep on coming. 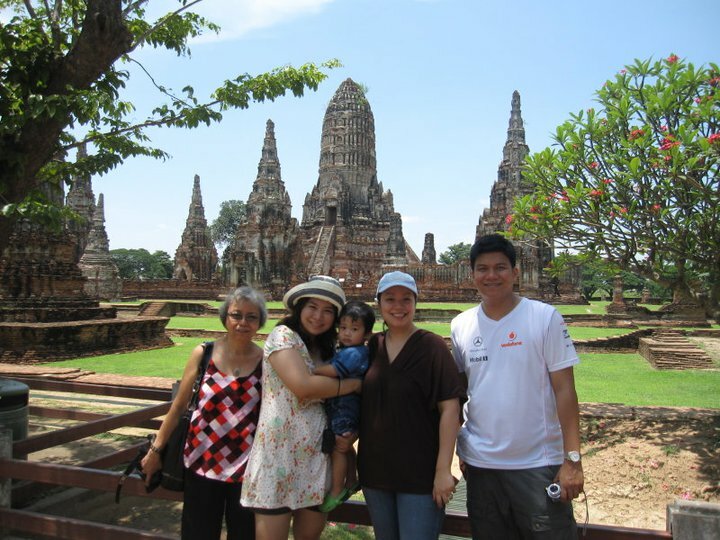 Would you believe that we have more visitors here in Bangkok than Cebu? Both sides of our families have visited us. Friends from my hometown in Bulacan found their way here, too. I am so looking forward to the visit of two of my best girl friends. Reunion is so sweet. New friends are not that difficult to find. The Lord is leading us to the right people. What I never thought would happen is the way my spiritual life is growing. 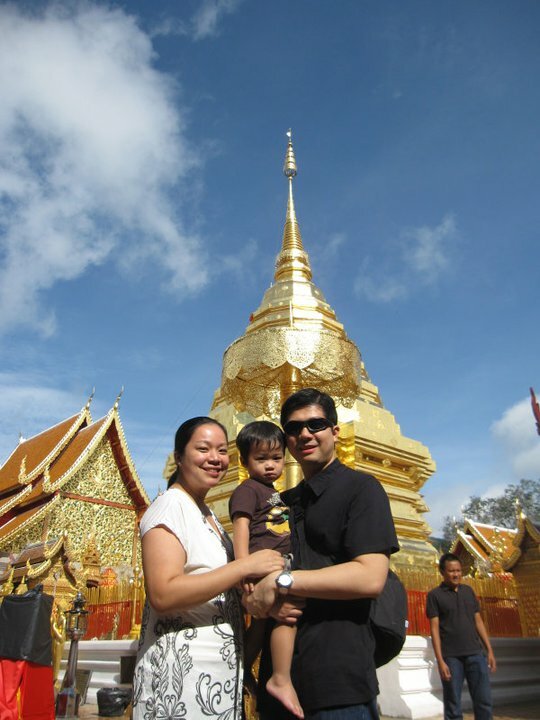 When I learned about our move here, it made me wonder what God has in store for us in a Buddhist country. Everything fell into place and I was astounded. We found our church. We met a lot of wonderful people. Jed started playing the keyboard again. We both belong to a small group. I finished my One-2-One and am going through The Purple Book now. Who would've thought that the goals (#4 and #5) I set for 2010 may happen here in Bangkok? And because we have great friends from church, Jed and I get to go on "date nights" during the day. These wonderful people look after Javi for a few hours. We still have so many places to explore, food and restaurants to try. I am looking forward to the opening of Uniqlo and IKEA in the next couple of months. So what's not to love about Bangkok? For now, none. 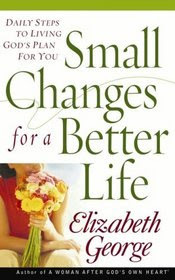 This is the last small change from Elizabeth George's book Small Changes For A Better Life: Daily Steps to Living God's Plan. Diligence is another powerful word similar to discipline. According to Dictionary.com, diligence is the constant and earnest effort to accomplish what is undertaken; persistent exertion of body or mind. Finishing this small change series took a lot of time and diligence. I would not have finished this if it were not for my determination and perseverance. Did you know that diligence affects every area of our lives? What motivates us to be diligent? Let me just share with you what motivated to finally hang the frames here in our house. It is the idea that our time here in Bangkok may be short. God may want to move us again. I want to enjoy our stay here to the fullest by accomplishing as many things as I could. And I start off with hanging the frames in our home. It is amazing when you have an idea of what God wants to happen in your lives. We just had a prophetic session in church this afternoon and it motivated me to be the best I could be starting with being the supportive wife for my husband and a mother raising a leader and worshiper. And there's so much more in the horizon for the three of us. Keep in mind that faithfulness and obedience will bring you blessings you would never have imagined. This life is a gift from God. What do you do with God's gift? Take care of it and use it for God's purpose. Time management is the key. Keeping a to-do/task list will keep us productive. Planning one's day in the morning helps us accomplish more during the day. Writing and reflecting on these small changes has helped me put God first in my daily life. It touched on every role I have - wife, mother, homemaker, daughter, sister, friend and so much more. It prepared me to do more and reach out to more people. This has been a learning experience for me, and I hope for you, too. I would love to hear what you learned from this series. To read about the first 17 small changes, click here. I am rock fan. I used to say I would give up my life savings should U2 come to Manila for a concert. When I said that I only had 25,000 pesos (around USD 580) or in my savings account. The next group on my list is Cold Play. I am fascinated that Chris Martin married Gwyneth Paltrow. Imagine him singing to her every night. I have this thing for men who sings and can play the guitar. Then God is funny, I ended up marrying a man who can sing, but instead of guitar, Jed plays the keyboard. My dear husband is a balladeer. As my relationship with Christ deepens, I found myself listening more to praise music. While Jed listens to Don Moen, I listen to Casting Crowns and Hillsong United. The weekend before the concert day, I still have no idea where the concert will be. Are we going to bring Javi with us? Would Jed be able to get out of work early? I just know how much God wanted us to watch the concert when all of a sudden, our friends from church fixed everything else - we now have a ride to the concert venue, someone volunteered to look after Javi. As the people were entering the concert venue, an announcement was made that the show might be cancelled due to electrical problems. The drummer had been electrocuted six times while the stage caught fire twice. Now that was awfully scary. While I felt sad, I understood. I felt sorry for the person who had to give the announcement and for the concert producer. I was teasing our friends to think about what to buy when we refund the ticket. We didn't leave the venue even after the announcement. We somehow had faith the concert will push through or that I would have a glimpse or the band members. Most people stayed and they even sang songs while waiting. At almost 10 o'clock in the evening, the concert started. Who would've thought, right? It was worship in an absolutely different level! It was like watching U2 but much better as everyone was worshiping God. Before this concert, I had no idea my type of music can be made into praise/worship songs. I even had a vision. 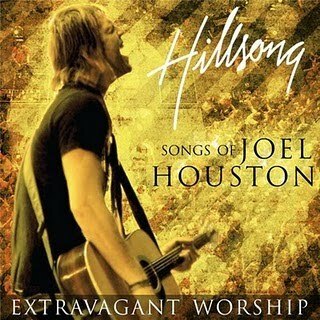 I saw my little boy worshiping God the way Joel Houston does - singing and playing the guitar. There is this prophecy that Javi will grow up to be a worshiper. Sharing with you my favorite Hillsong United song at the moment, From The Inside Out.